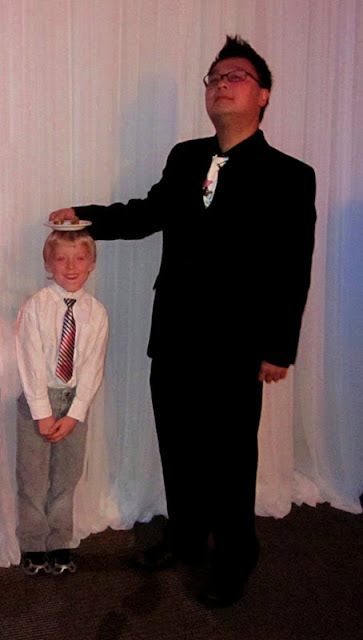 Before heading out to the Tinkerbell Half Marathon, I attended the DSE Awards Banquet & Gala! This is the Golden Globes of running. All runners dress up in their finest for this event, feast on a meal, and congratulate their peers as they pick up various awards throughout the evening. I walked away this year with second place for most race miles of the year. 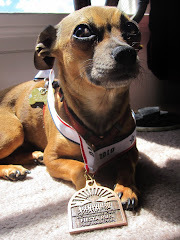 Yup, I ran 52 marathons in 52 weeks this year and placed second over all! Here's the killer: I lost by 2 tiny miles. That one DNF at Drag 'N' Fly cost me the big prize! I'm fine with this, as most race miles was not my ultimate goal. I had my eyes on that Titanium prize, and at the end of the year, I got my ten stars. WIN! 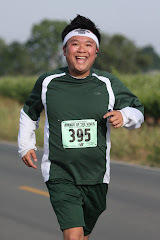 My DSE running family all came out for this event and the paparazzi went into high gear. The following photo is, hands down, the best of the evening. I love this little guy. Riley is my little side kick and this kid took home a big trophy for completing 10 DSE races this year! I have him my own special trophy: a plate with two egg rolls on it. Congratulations Riley! After the gala, I headed down to Southern California for Tink. It was a long drive through the night, and I was was very happy to arrive at my Motel 6 in Anaheim. 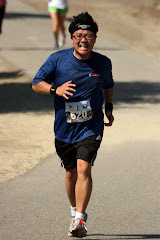 I spent Saturday hanging out at Disneyland with some running peeps and then on Sunday ran the race. I had fun hanging out with my friends, but the race was pretty painful. 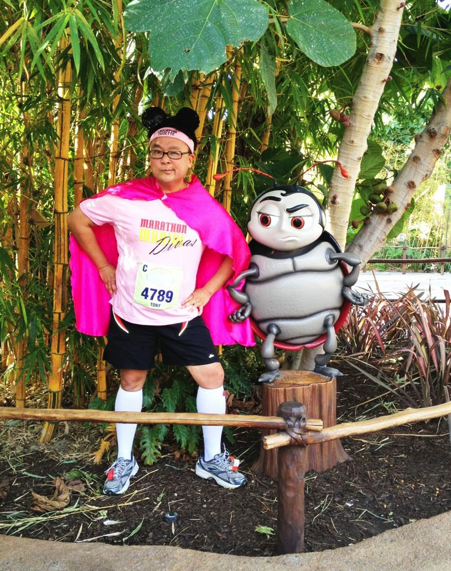 I opted to walk the whole way, which is the thing to do at a Disney race. 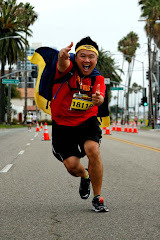 Any half marathon put on by Mickey Mouse is a parade! You're supposed to leisurely walk it and have fun! I kept telling myself this through out the race. The truth of the matter is that I'm out of shape and I'm going to have to do something about it. I've gained so much weight that I couldn't pull off the running skirt, which was my plan for Tinkerbell. I was going to be the sexiest Endorphin Dudette ever! Well, I did have the pink cape and the Marathon Maniac Diva shirt, but the skirt was a no go. 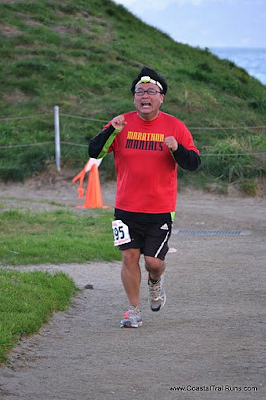 I emailed the ladies at Running Skirts and let them know that once I drop the weight, I'll sport their creation. It'll happen! Hopefully sooner than later. Wow. I just ran a 45:20 5k. I can't even call what I did running. I don't think I can even call what I did walking! This is not good. 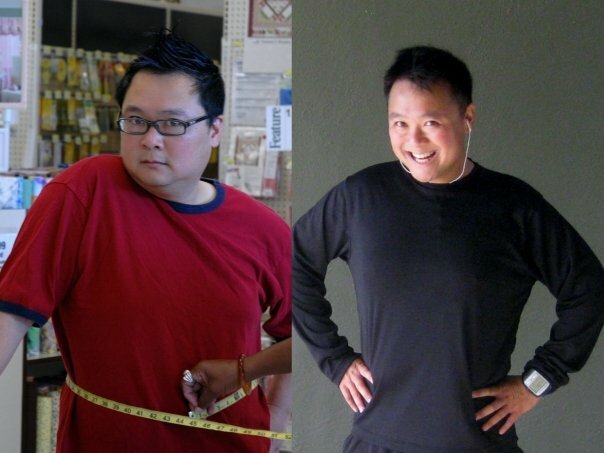 I am out of shape and I need to do something about it. I guess the first step was actually getting out there and doing it. I could have easily just stayed in my warm bed with the chiweenie. Thank goodness my DSE family was out there. The last thing I need is people laughing and throwing bagels at me (not that anyone has ever thrown carbs at me at a race before)! Ooh, there are actually runners shorter than me! 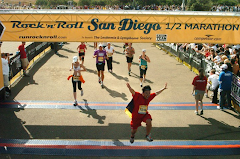 With Titanium done, I can now return to my happy running club, Dolphin South End Runners. 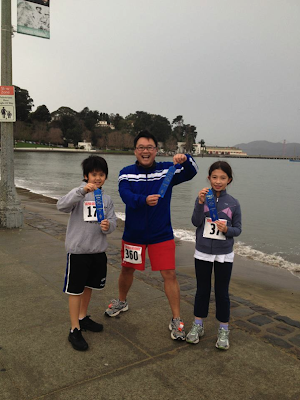 I opened my DSE season as a race director for the Golden Gate 10k! 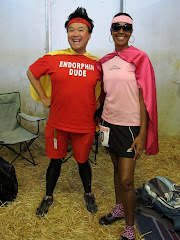 Together with my partner in crime and co-race director, Diann "Fun Size" Leo, I made sure that every runner crossed that finish line and had fun. A lot of people showed up. I guess it's that new year's resolution thing! 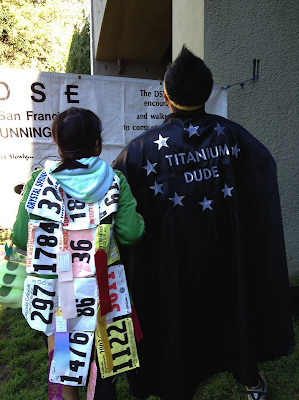 Fun Size showed up in a cape too! 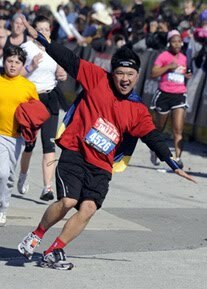 After the New Year's One Day race in 2010, I boldly made this statement: "I have lofty goals for 2011. 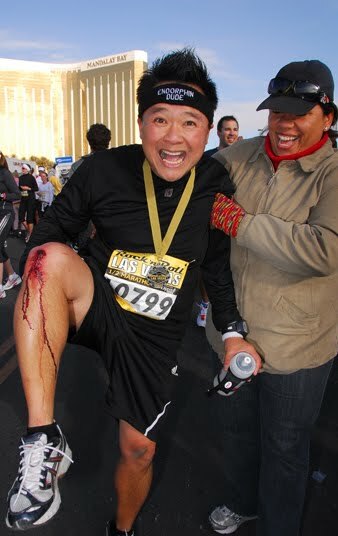 I will be going for the Titanium, which is the highest level in Marathon Maniacs. In order to achieve this, I will need to complete 52 marathons in one year. I can do it. I firmly believe I can do it. By this time next year, you will see 10 stars by my name." One year later, I came back to where it all started and nailed my first 50 miler. I threw in two additional miles for good measure. 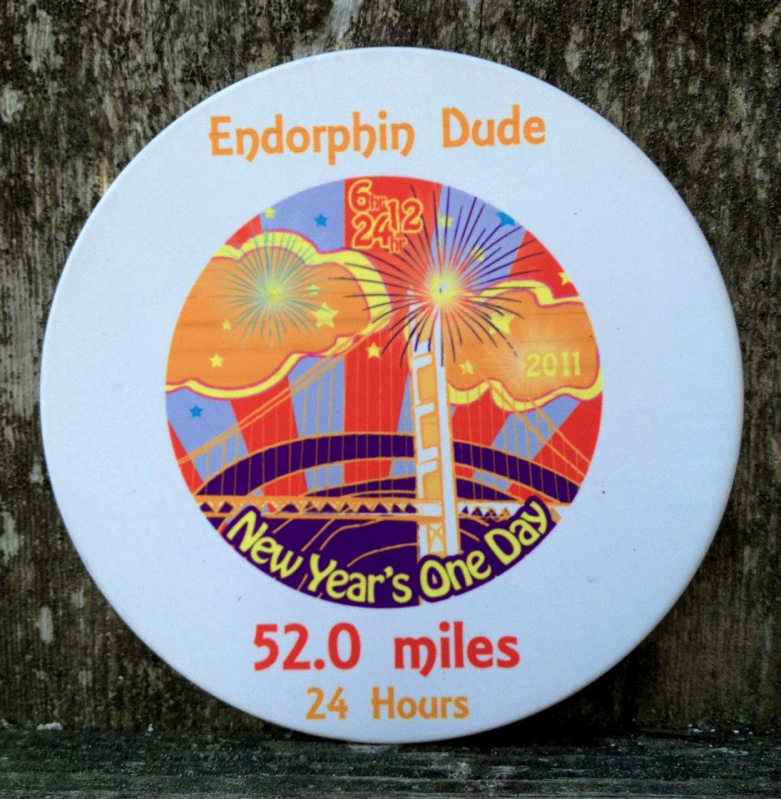 52 marathons in 52 weeks with #52 being a 52K and then a 52 miler two days later to cap off an incredible 2011. 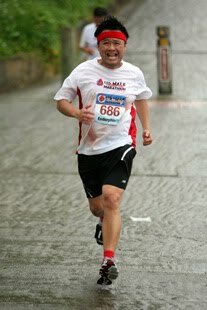 I nearly lost it when I crossed that finish line. Sometimes the paparazzi catches you at your very worst. This is not one of those times. I am not afraid to publish this photo because it truly captures the raw emotion I felt when I was moments away from completing the toughest task of my life. I may not be smiling in this photo, but if you put an x-ray in front of my chest, you will see my heart grinning from valve to valve.